1999. 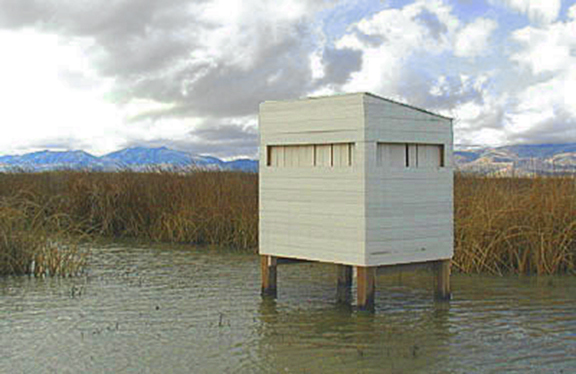 One of the first two photo blinds built with NANPA Foundation funding, at Bear River National Wildlife Refuge, Utah. 2000. One of two photo blinds at Sonny Bono-Salton Sea National Wildlife Refuge, California, built with funds from the NANPA Foundation. 2004. 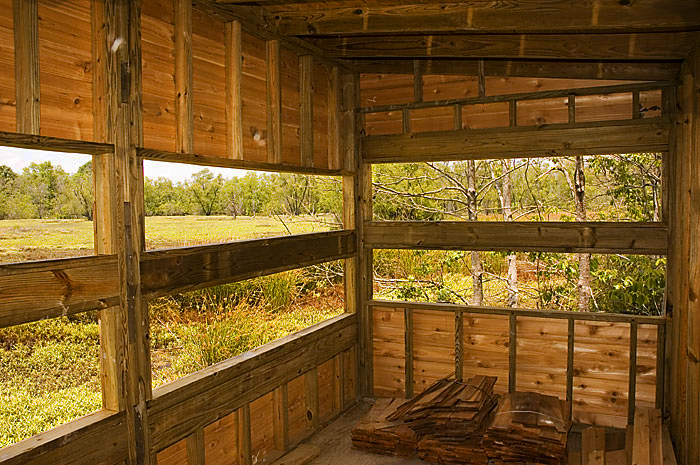 Construction of Foundation-sponsored photo blind at Black Bayou Lake National Wildlife Refuge, Monroe, Louisiana. January 18, 2005, near Charlotte, NC. 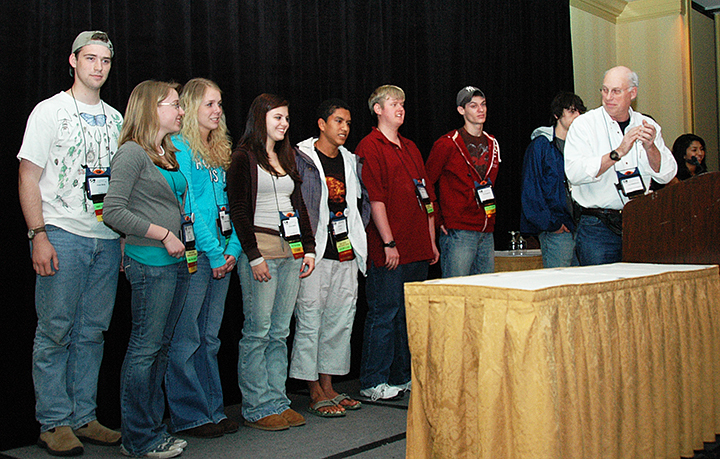 Pro photographer Arthur Morris (left) instructs high school students in the field, part of the students' experience of NANPA's Summit and Trade Show. August 2005. 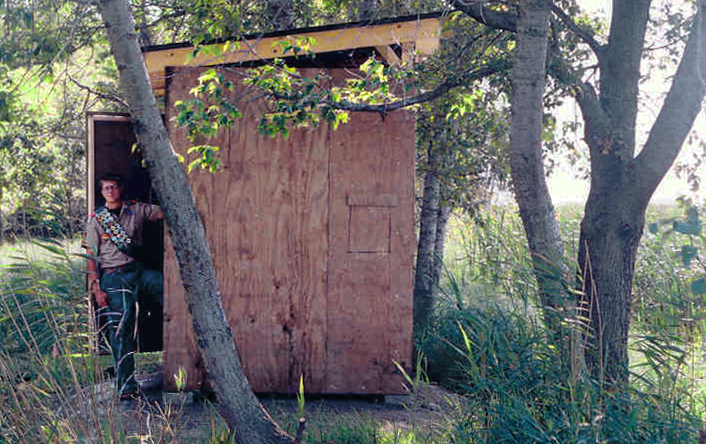 Photo blind completed by Boy Scouts at Agassiz National Wildlife Refuge, Minnesota. 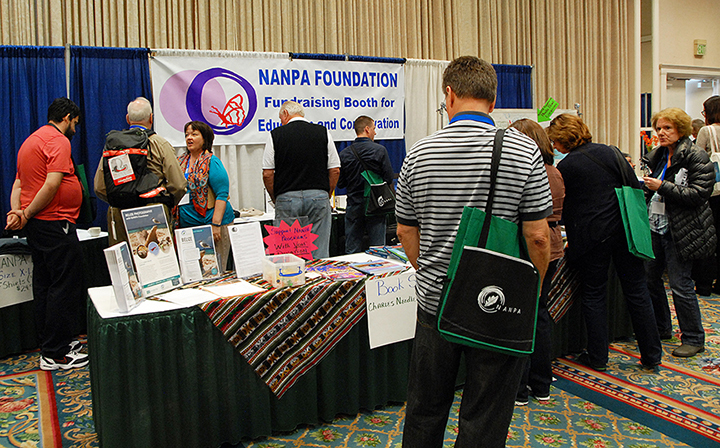 In 1996, NANPA approved the creation of a foundation to fund its educational goals. Operating as a non-profit, 501(c)3 organization, where donations to it are tax-deductible, the NANPA Foundation has a history rich with achievements. Look through the years to see how far we’ve come. February–May. NANPA approves creation of the NANPA Infinity Foundation as a non-profit, tax-deductible organization to advance awareness and appreciation of the environment through photography and education. 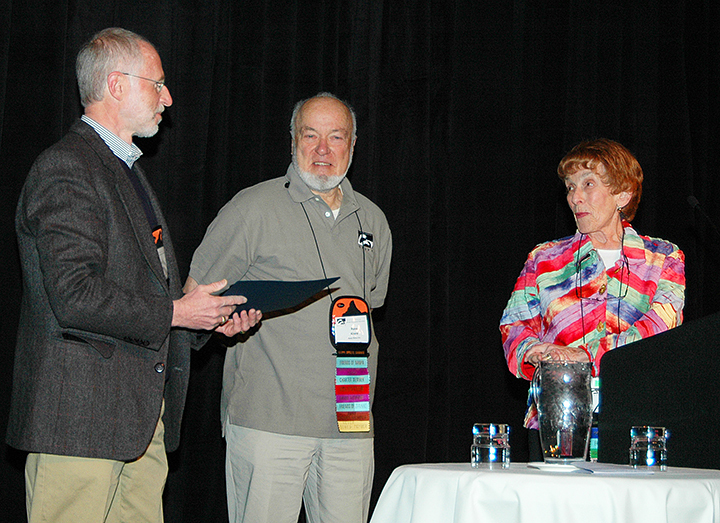 NANPA Board members Karen Hollingsworth, Mark Lukes and Rick Zuegel serve as the founding Board of Trustees, with Mark Lukes as president. Jerry Bowman and Francine Butler of the Resource Center for Associations, executive directors of NANPA, are named executive directors of the Foundation as well. Fundraising plans begin. January 16-19. The first High School Student Scholarship Program to be sponsored by the Foundation, rather than NANPA directly, occurs at NANPA’s third Nature Photography Forum, titled “Partnerships,” in Corpus Christi, Texas. Selected students attend the gathering, meet and learn from established pros in the industry, and show their images to attendees in a formal program. In this and future Summits, the students are supported by numerous manufacturers with the loan of cameras, lenses, computers, software, tripods and other photo gear. The Foundation initiates a Silent Auction at the Forum to raise further funds for this program. May. The high school scholarship students publish their first newsletter, Riptide, written and designed by them and funded by the Foundation. July 17. A program to install or improve photo blinds at selected national wildlife refuges is proposed by Jane Kinne, NANPA President, with funding to come from the Foundation. October 8. At the signing of a Memorandum of Understanding between NANPA and the U.S. 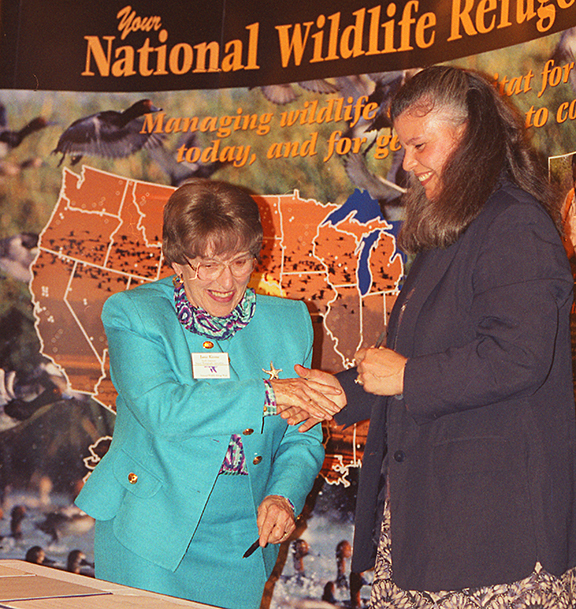 Fish and Wildlife Service (FWS), NANPA president Jane Kinne discusses the photo blind project with Jamie Rappaport Clark, director of the FWS. Through the Foundation, FWS agrees to fund part of the cost of construction for each blind. January 13-18. At NANPA’s fourth Nature Photography Forum, called “Photography to the Extreme,” near Haines City, Florida, ten high school students spend a day learning from pro photographer Art Wolfe at Walt Disney World’s new Animal Kingdom. March. The Foundation selects the first four national wildlife refuges for installation of photo blinds: Bear River, Utah; Cameron Prairie, Louisiana; Ruby Lake, Nevada; and Sonny Bono-Salton Sea, California. The Foundation is granted formal 501(c)3 status, allowing all donations to be fully tax-deductible. October. 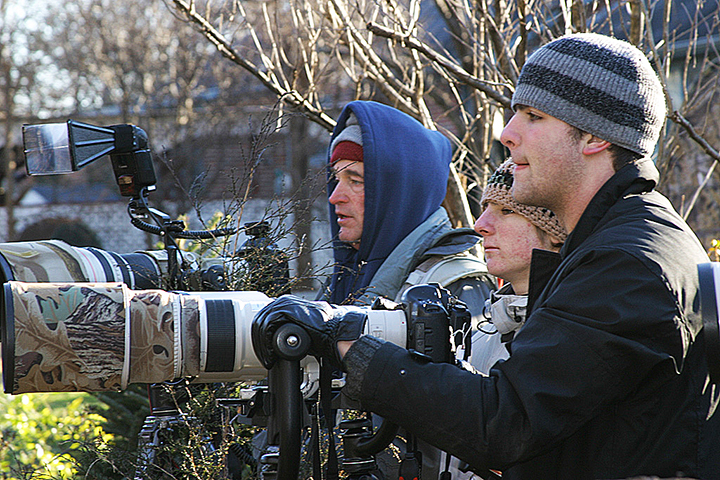 The Foundation’s 1998 high school scholarship students are featured on an episode of the television series, “Nature’s Best Photography,” a 13-part series on the Outdoor Life Network, sponsored by Nikon and the National Wildlife Federation. February 2-7. “Creativity 2000” in San Diego, California, the fifth NANPA conference, now called a Nature Photography Summit, hosts another group of high school students. Additional hands-on learning activities with pro photographers are added before and during the Summit. At the Summit the Foundation sponsors a presentation, titled “Exploring the Photographer / Writer Relationship,” with pro photographer Pat O’Hara and environmental writer and poet Tim McNulty. The program is open to the public and a small fee is charged. May. 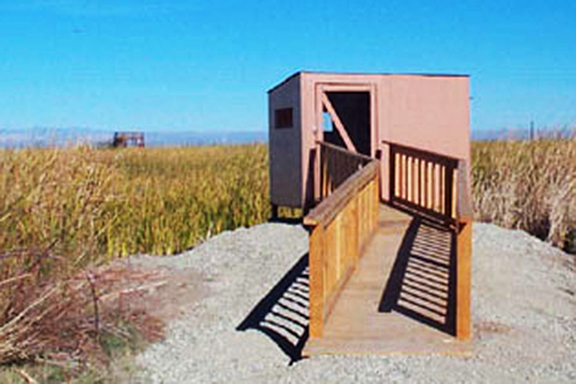 The first two photo blinds, sponsored by the Foundation, are completed at Bear River National Wildlife Refuge, Utah. January 12-16. 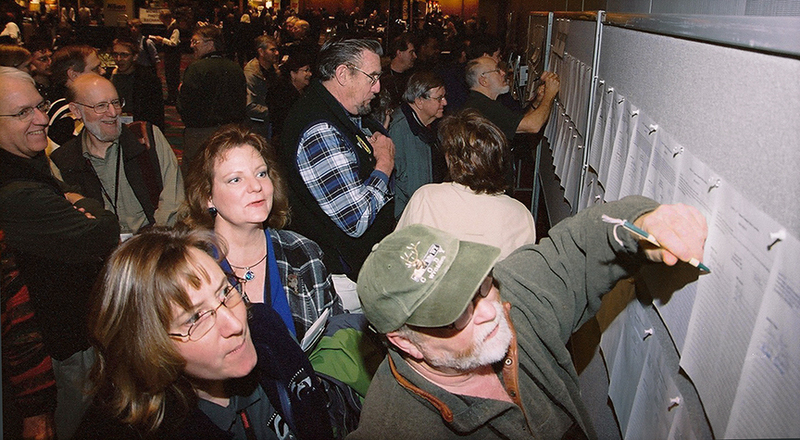 At NANPA’s sixth Nature Photography Summit in Austin, Texas, named “Biodiversity 2000,” the Foundation adds to its successful Silent Auction with a Live Auction, where time with pro photographers and editors is auctioned off. Once again, the Foundation funds a select group of high school students to attend the Summit. January 17-21. Selected high school students sponsored by the Foundation attend “Odyssey 2001” in Las Vegas, Nevada, NANPA’s seventh Annual Summit and Trade Show, for a week of hands-on learning from pro photographers and editors. The Foundation’s Silent and Live Auctions are expanded, with a resulting increase in donations. By mutual agreement, the Foundation assumes management of NANPA’s High School Student Scholarship Program while continuing to fund it..
January 16-20. 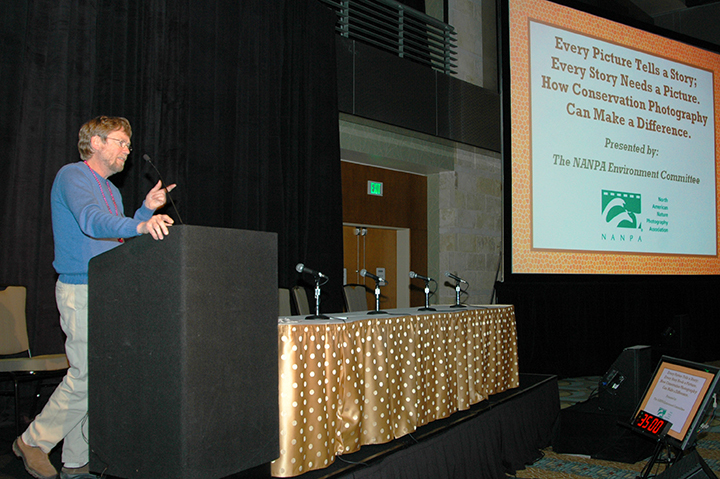 The Foundation sponsors ten more high school students to attend “Alternatives 2002” in Jacksonville, Florida, NANPA’s eighth Annual Summit and Trade Show. The Foundation names researcher Dr. Jane Goodall, photographer and motivational speaker Dewitt Jones, and biologist and conservationist Dr. Thomas Lovejoy as Honorary Trustees. February 19-23. 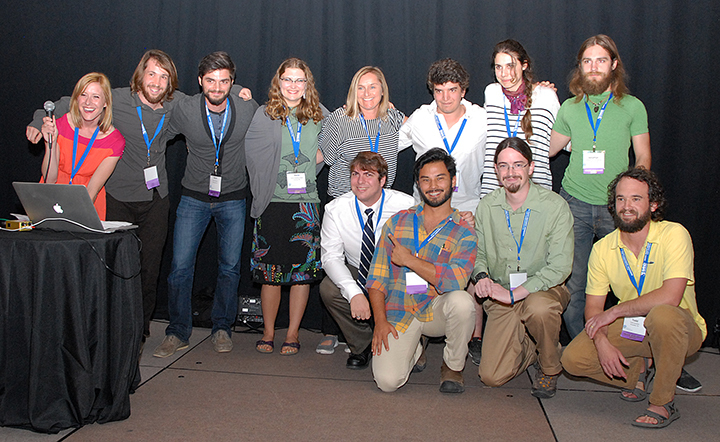 A generous NANPA member fully funds, though the Foundation, a group of college students to attend NANPA’s ninth Annual Summit and Trade Show, called “Legacy 2003,” in Albuquerque, New Mexico. 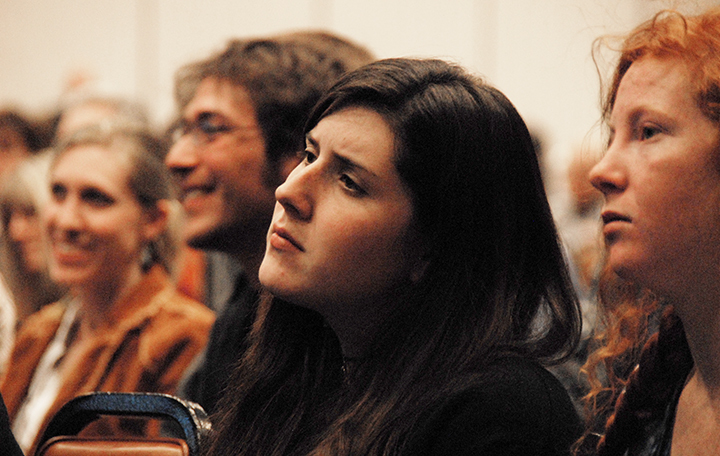 The students network with attendees, learn from industry pros, and receive portfolio reviews. Another eager group of high school students also attend and learn how to enhance their photography. April 22. Based on the positive experiences of the college students attending the Summit in February, the Foundation approves to fund and manage a new College Student Scholarship Program. July. The Foundation and the U.S. Fish and Wildlife Service renew their agreement to continue FWS funding for new refuge photo blind construction. The Foundation returns operation of the High School Student Scholarship Program to NANPA. January 21-25. 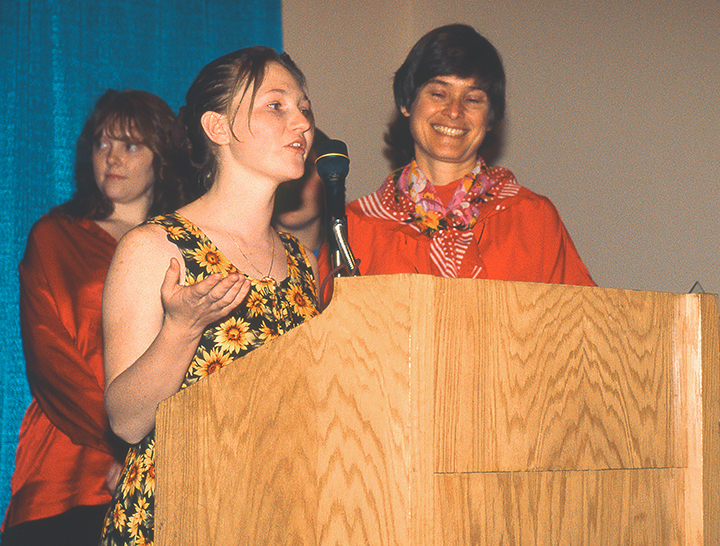 The Foundation’s College Student Scholarship Program debuts at “Discovery 2004” in Portland, Oregon, NANPA’s 10th Anniversary Summit and Trade Show. 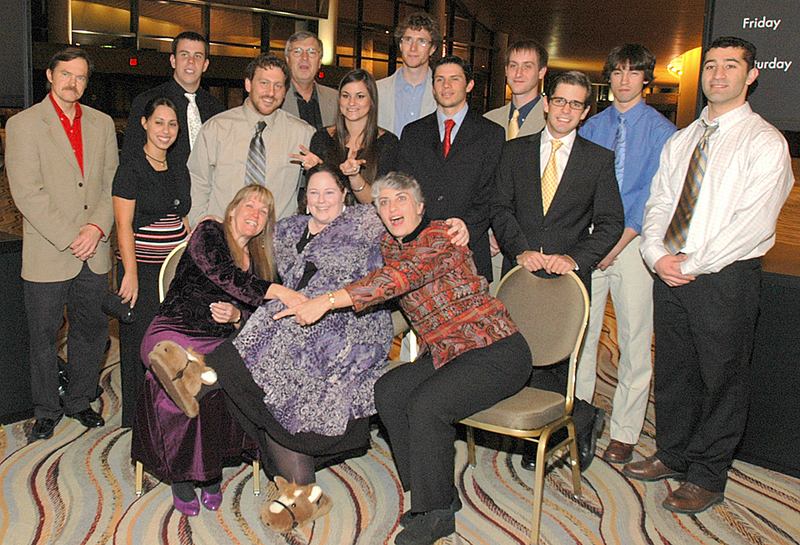 The Foundation sponsors eight college students, as well as ten students in the traditional High School Student Scholarship Program. Foundation President Jane Kinne steps down to take on the important task of Development Director and find corporate funding for the Foundation. July. The presidents of NANPA and the Foundation sign a Memorandum of Understanding to solidify and strengthen their relationship. The Foundation drops “Infinity” from its name. The Foundation agrees to transfer management and operation of the College Student Scholarship Program and the Refuge Photo Blind Program to NANPA while continuing to fund them. An Adopt-a-Student Program is set up to allow donors to fully sponsor a student to attend a Summit. The Foundation also establishes a Memorial Fund to allow donations to be made in memory of deceased NANPA members. January 19-23. Groups of high school and college students are once again sponsored by the Foundation to attend “Traditions” in Charlotte, North Carolina, NANPA’s 11th Annual Summit and Trade Show. 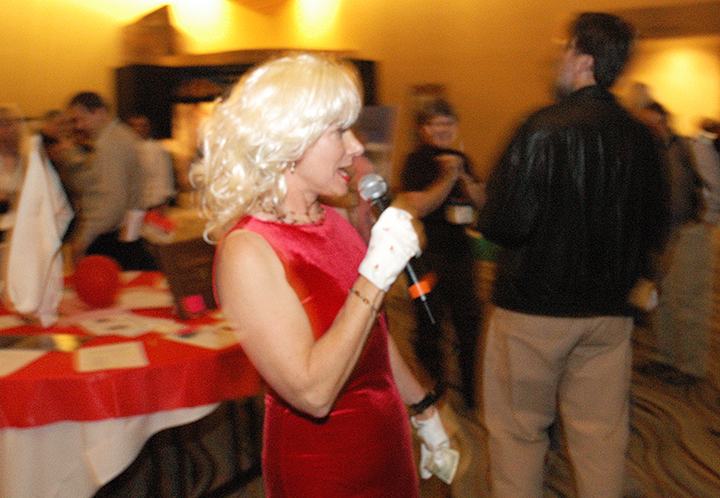 Successful silent and live auctions and on-site donations from Summit attendees complete the needed funding for the students, which until then had been in doubt. July 17. Development Director Jane Kinne reports that some of the corporations she approached for funding have replied that the projects the Foundation supports are all NANPA related and not broad enough, or that the Foundation is too new or small, to consider funding. Nevertheless, she will update the informational packet and continue to contact corporations. The Foundation realizes that, for the time being, fundraising will continue to rely on individual donations and Foundation projects. September. The number of photo blinds being built on national wildlife refuges through NANPA’s Photo Blind Program, with funding from the Foundation, reaches 30 with completion of a blind at Modoc National Wildlife Refuge in California. January. An educational corporation donates $2,500 to the Foundation, the first such donation arising from corporate fundraising efforts. Also, a photography magazine donates $5,000 to support NANPA’s Expressions publication. February 8–12. The Foundation sponsors two more groups of high school and college students to “Frontiers,” NANPA’s 12th Annual Summit and Trade Show, in Denver, Colorado. A new Community Outreach Event at the Summit, sponsored by NANPA’s Environment Committee, collects funds for the Foundation’s Philip Hyde Grant. New at the Foundation’s auctions this year: time with professionals moves from the Live Auction to the Silent Auction, with two closing times, and the Live Auction features an ocean cruise and a photo workshop. Following a strategic planning session, a new mission statement is adopted. July 22-23. The Foundation’s trustees extend formal thanks to Executive Director Jerry Bowman on his retirement. Francine Butler remains as the sole Executive Director. January 17–21. NANPA’s 13th Annual Summit and Trade Show is held in Palm Springs, California, and once again the Foundation sponsors select groups of high school and college students to interact with top photo professionals. In place of its Live Auction, the Foundation offers a more lively Silent Auction, with a printed brochure listing all the items, a “buy-it-now” option on most items, and three different closings spaced out during an evening reception for all Summit attendees. The Community Outreach Event, sponsored by NANPA’s Environment Committee, presents programs by a number of conservation photographers. Funds are donated to the Foundation for its Philip Hyde Grant. The Foundation approves hiring a NANPA member as a grant writer for one year to research potential fundraising sources and submit grant requests. July 14-15. For the first time, the Foundation accepts a photographer’s proposal to serve as the funding host for her environmental photo project. This new approach lays the groundwork for future such requests. The Foundation’s list of possible corporate grant sources that have been researched reaches 75. The solicitation letter to these companies is updated to include specific programs for support. The Foundation agrees to fund part of the costs of NANPA’s Road Shows and Regional Events. November 3. Development Director and Past President Jane Kinne unexpectedly passes away, leaving a large hole in the Foundation’s fundraising. February 27–March 2. High school and college students attend NANPA’s 14th Annual Summit and Trade Show in Destin, Florida. The NANPA Environment Committee’s Outreach Event, this year also sponsored by the International League of Conservation Photographers, features presentations by ILCP founder and executive director Cristina Mittermeier and pro photographer Brian Skerry. Proceeds are once again given to the Foundation for its Philip Hyde Grant. During a tribute to trustee and Past President Jane Kinne, the Foundation receives $20,000 in her memory from the Foundation’s current and former executive directors. Russ Kinne donates his wife’s “coat of many colors” as a potential future fundraiser. It’s auctioned off at the Summit and the buyer donates the coat back to the Foundation. July 13. The Foundation creates the Jane Kinne Endowment Fund, with the $20,000 donation given at February’s Summit as its initial deposit. Financial oversight of the Community Outreach Event at each Summit is moved from NANPA to the Foundation. February 18–22. NANPA’s 15th Annual Summit and Trade Show is held in Albuquerque, New Mexico, and once again the Foundation sponsors students from high schools and colleges to attend and learn. 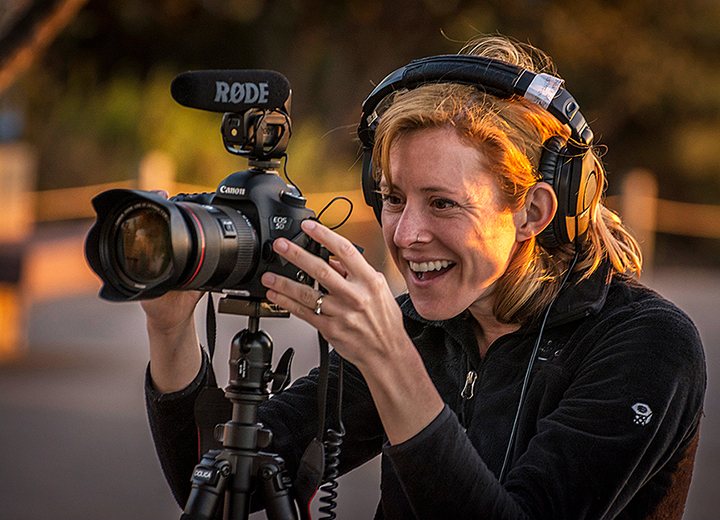 Canon USA provides a $25,000 grant to support the program, in addition to making cameras and lenses available, as it has each year. Conservation photographers Daniel Beltrá and Chris Linder present programs at the Outreach Event, sponsored by NANPA’s Environment Committee, with funds given to the Foundation for the Philip Hyde Grant. NANPA returns operation of the Refuge Photo Blind Program to the Foundation. July 19. The Foundation approves a redesign of its website. The trustees note that individual donations have been dropping and new approaches to fundraising are necessary. January. Executive. Director Francine Butler retires and is praised by the Foundation for her work since its inception. Annette Rogers is named executive director. February 16–21. High school and college students attend NANPA’s 16th Nature Photography Summit in Reno, Nevada, with sponsorship from the Foundation. The Outreach Event, organized the NANPA’s Environment Committee, features pro photographers Garth Lenz and Piotr Naskrecki, with proceeds going to the Foundation’s Philip Hyde Grant. July 17–18. As part of its effort to find new fundraising approaches, the Foundation agrees to a partnership with Holbrook Travel to provide NANPA-branded photography tours from which the Foundation will receive a predetermined amount. The Foundation approves of the concept to allow NANPA’s High School Student Scholarship Committee to pursue grants on its own for the development of its program, with funds passing through the Foundation. March 9–12. The Foundation sponsors high school and college students at NANPA’s 17th Nature Photography Summit and Trade Show in McAllen, Texas. The college students photograph and design a slide show which is donated to local nature center Quinta Mazatlan for its use in education and fundraising. NANPA’s Environment Committee hosts another Conservation Outreach Event, with proceeds going to the Foundation’s Philip Hyde Grant. Featured are conservation photographers Patricio Robles Gil and Amy Gulick. May 13. Having the same financial and other concerns as NANPA, the Foundation terminates the contract with Resource Center for Associations. June 14. Susan Day, NANPA’s new executive director, is named executive director of the Foundation as well, replacing Annette Rogers, who is thanked by the Foundation for her efforts over the years. During the following months, the Foundation’s office is moved to Alma, Illinois. July 18–27. In partnership with Holbrook Travel, the Foundation sponsors its first photo trip. The tour to Iceland is led by pro photographer Dee Ann Pederson. Participants enjoy photographing Iceland’s glaciers, volcanoes, waterfalls and wildlife. March 31–April 1. Executive Director Susan Day reports that most of the transition to in-house management is complete. However, the change has slowed most Foundation fundraising projects. Not having a Summit this year has meant further loss of fundraising possibilities. The trustees discuss various options for fundraising, one of which is to recommend that NANPA and the Foundation hire a marketing expert to promote both organizations. June. NANPA Past President Bill Plunkett becomes the Foundation’s primary executive director, with Susan Day serving as backup and coordinator with NANPA. August 3–13. Pro photographers Cindy Miller Hopkins and Karine Aigner lead a Foundation photo trip to the Galapagos. Participants photograph many of the islands’ iconic wildlife above and below water, including blue-footed boobies, tortoises, land iguanas and sea lions. February 28–March 3. Sponsored by the Foundation, high school and college students attend NANPA’s 18th Nature Photography Summit in Jacksonville, Florida. In place of auctions, the Foundation operates a successful fundraising booth called the Marketplace in the Trade Show. Clothes, books, prints, software and camera equipment, all either donated or purchased at a discount, are among the items sold to attendees. Beth Huning, the 2011 Philip Hyde Grant recipient, gives a presentation on restoring wetlands in San Francisco Bay, the topic of her grant application. October. Ten images from the high school students who photographed with pros at the 2013 Nature Photography Summit are included in the Grand Opening exhibit of the International Photography Hall of Fame in St Louis, Missouri. August 10-22. The Foundation sponsors a photo tour to Alaska, led by widely traveled photographer Dee Ann Pederson. Participants visit the Copper River Delta, the Kenai Peninsula and Lake Clark National Park, among other sights. They photograph bears, sea otters, puffins and other wildlife. August 16-17. The NANPA and the Foundation boards discuss the future of the High School Student Scholarship Program and ask the committee to revamp the program. Past students have found the personal attention given by pros to be most valuable, so the committee will discuss ways of emphasizing this aspect, perhaps at a different venue. Foundation trustees vote to participate in the AmazonSmile Program. February 18–22. The Foundation sponsors a group of college students to participate in NANPA’s 19th Nature Photography Summit and Trade Show in San Diego, California. 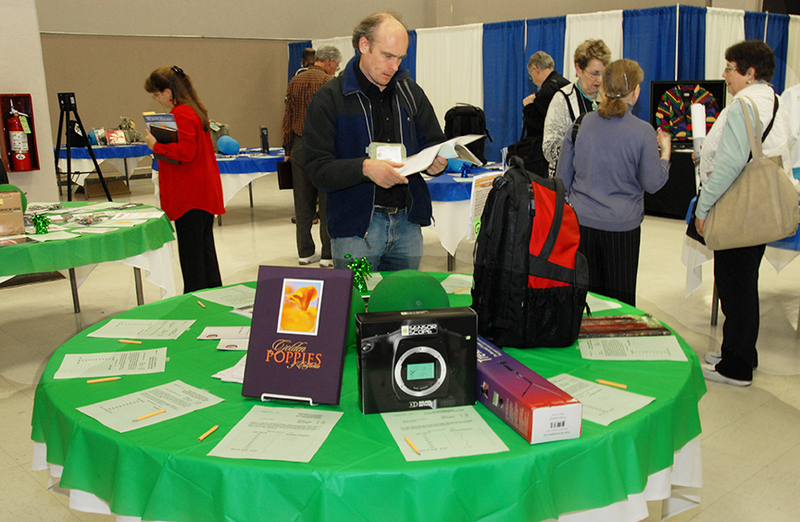 The Foundation’s Marketplace again offers clothes, books and other items for sale to Trade Show attendees. April. Executive Director Bill Plunkett steps down and receives thanks from the trustees for his work. Teresa Ransdell is named the new executive director. November. Begins Foundation’s first crowdfunding campaign to raise money for the 2016 NANPA High School Scholarship Program to take place July 2016 in Tremont, Tennessee. December. Selects Alison M. Jones as 2015 Philip Hyde Environmental Grant recipient and Michelle A. Butler as the 2015 Janie Moore Greene Grant recipient. June. NANPA Foundation Board of Trustees meets for a strategic planning meeting to map out the future for the organization.